Seafood and cheese. How many times have you gone to a fine dining restaurant and asked for cheese on your seafood dish only to be looked at like if you didn’t know what you were doing? Especially if you are at an Italian restaurant. For some reason, Italian Moms consider it a crime to put cheese on anything remotely close to fish or seafood. The reasons vary but most agree that many Italian kinds of cheese are so strong in flavor that they would overpower the taste of the fish or seafood. The same does not occur in many other cultures where we see wonderful recipes featuring the most delicate fish or seafood coupled with cheese. It is all about the art of combining the ingredients properly. 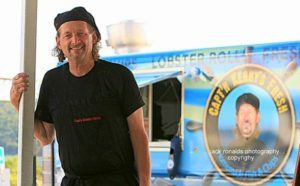 In this new episode of “The Capt’n Galleys”, Capt’n Kenny uses Scallops and Shrimp with aged Cheddar cheese. Here is the recipe if you would like to prepare it at home. Mix the Chopped Scallops and Shrimp together with the green onions, chilies, cheddar cheese and 1 lightly beaten egg. Set aside on the fridge for cooling down for 15 minutes. In separate dishes put the 1/4 cup of flour, 2 lightly beaten eggs and the breadcrumbs for breading. After the 15 minutes, take the seafood mix out of the fridge and make it into small balls. Roll them into the flour, then the eggs and finally into the breadcrumbs. Make sure you get good coverage. Chill the patties in the fridge for 15 more minutes or until you are ready to serve them. Cook the patties on a pan with the butter and olive oil 15 minutes per each side until brown on medium heat. Cut the Mangoes and Pineapple in small cubes, Add the minced red onion and fresh lime and mix together. Chill until ready to serve. Mix the olive oil, fresh lemon and salt and pepper together and add to your choice of greens and chopped celery leaves when ready to plate the patties. Plate the cooked scallop cakes on the field greens and top with the Mango and Pineapple mix. Notes: You can use any type of breadcrumbs, regular, Panko or Italian. They all work fine. You can shape the mix into patties, small croquettes or appetizers. You can leave the pre-made mixture in the fridge overnight, or you could prepare them, leave them a day before in the fridge and re-heat them in the toaster oven as needed. It's a very versatile dish. As always, please leave us a comment and let us know how you like it! Enjoy! ← Spicy Asian Coconut Shrimp. Our New Show! Thank you so much, Jonathan, for always being there and all your support! Este plato es muy sabroso para prepararlo en familia. Avisanos cómo te quedó cuando lo prepares. Gracias!